Have you ever wondered why you might love a particular Pinot Noir from 2013, but may not be as fond of the 2014? If so, you’re not alone. The answer is complex, just like the winemaking industry. Having an understanding of these variations will give you a greater appreciation of just how much goes into making that 2013 vintage that you love so much. Why does a wine differ in taste from year to year? There are an endless number of variables that can have an effect on how a particular year’s yield will taste. However, there are two main factors that winemakers can confidently rely on being ever-changing. There are countless variables in nature that can have a major impact on the outcome of grapes. There are a few main factors that winemakers must pay close attention to. Precipitation. The amount and timing of rainfall directly impacts a winemaker’s end product. If there is too much rainfall around harvest time, vines will absorb water, diluting the grape and causing an imbalance in flavor. Growers are looking for just the right amount of precipitation before harvest. The land the grapes are grown in (soil). The soil that grapes are grown in can have an astounding impact on wine. For example, grapes that are planted in rich, fertile soil with lots of moisture will often produce light and fruity wine. However, the same grapes planted on a hill-side with broken up, dry soil cause the vines to work harder to get nutrients. This produces a more robust wine with higher tannins. Temperature. The temperature that grapes are grown greatly impacts what kinds of varietals should be grown in a given region. Some grapes flourish in moderate temperatures, while others grow best with warm days and cooler nights. And some grapes grow best in extreme heat (for example, Cabernet Sauvignon and Zinfandel). The date of harvest. The exact time that grapes are picked has a much higher impact on the overall taste of a wine than you might think. If grapes are harvested earlier, the wine they produce will have a lower alcohol content and higher acidity. Conversely, if grapes are picked later in the season, there will be more sugar present, which translates to a higher alcohol content and less acidity in the wine. The goal is to pick grapes when acidity and sweetness levels are balanced. Aging process. Wine is aged in either oak or steel. The result? Oak-aged wine is more traditional and produces natural aromas like nutmeg, vanilla, and cinnamon. Steel barrels produce a zestier, more refreshing wine, like Pinot Gris. Wine aged in steel barrels has become more common in recent years due to its value proposition (reuse of barrels, easier cleaning, more control over oxygen exposure). When it was bottled and how it was stored. What might sound like a very simple step in the winemaking process is another critical phase that demands a winemaker’s planning and expertise. Exposure to oxygen can make or break a wine during this important step. Winemakers must walk a fine line between aging (good) and oxidizing (bad) wine. This means wine must be stored at the right temperature in properly sealed bottles. Other factors include keeping the wine in a dark, consistently cool space, minimizing movement and knowledge of what wines usually improve with age. These, among many other factors, all contribute to why that 2013 Pinot Noir was so outstanding! How knowledgeable are you about wine? Take our wine quiz to see if you’re on your way to becoming a wine connoisseur! The world of wine can be intimidating. With so much information, regions and varietals to choose from, it can be challenging to know where to begin. A beginner wine connoisseur might know key differences between a red and white, but it’s also important to understand the nuances between all wine types and varietals. See how much you know with Regale’s first wine quiz. Can you answer these 10 questions about wine and the growing process correctly? True or False? Grape vines are deciduous, meaning they lose their leaves during winter months. 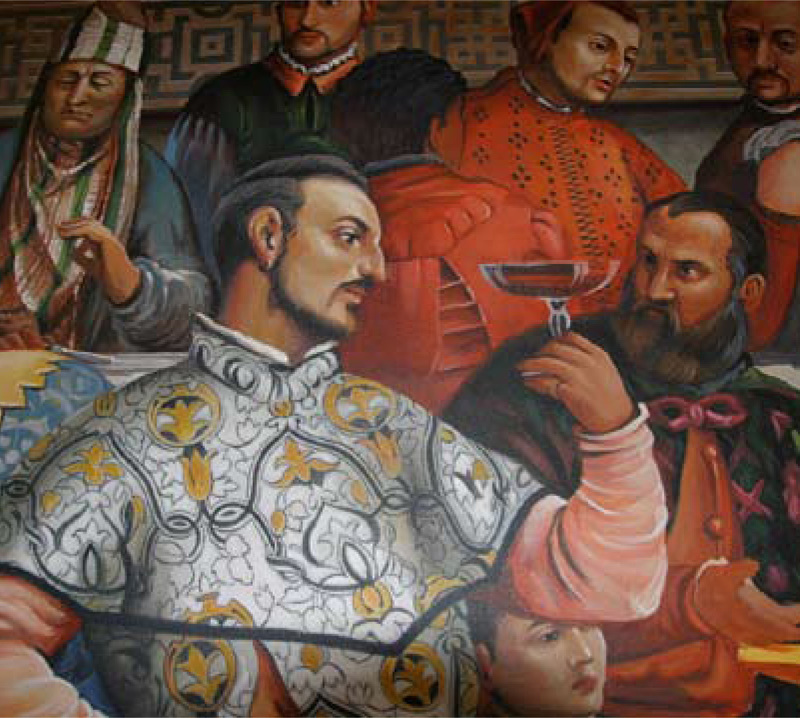 Why should you drink dry wines before sweet wines? How long does it take newly planted grapes to bear fruit worthy of winemaking? What is the difference between red wine and white wine? A – Red wine is harvested later and therefore darker in color. B – Red wine is made from a different kind of grape. C – When red wine is produced, the skins of the grapes are left inthe wine during fermentation. Which of these wines is usually a little sweet? Which of these red wines is commonly described as a little spicy or peppery? What gives champagne its effervescence (bubbles)? A – Champagne is aged in a steel barrel. B – Bubbles are added during bottling for taste. C – Champagne goes through a second fermentation process (usually with yeast and sugar). What word describes the apparent weight of a wine in your mouth (light, medium or full)? What is the ideal temperature to serve red wine? C – It varies depending on the body of the wine. It’s true that the most beautiful thing at a wedding is always the bride, but Regale’s multicolored array of flowers, towering trees, and greenery will only serve to complement and enhance her beauty. Your wedding photos will have the look of an Italian destination wedding without the cost. An added bonus: It’s virtually impossible to take a bad wedding photo when you’re surrounded by a gorgeous background. 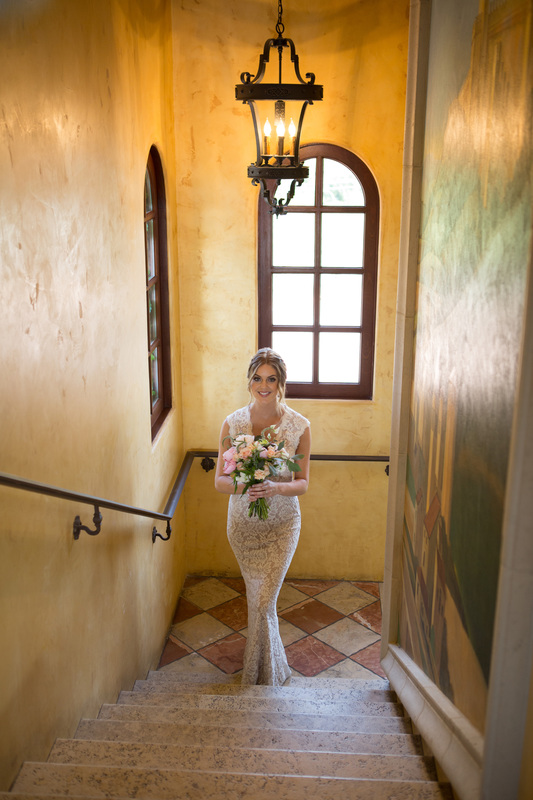 The second-story room in our villa is the perfect spot for a bride and her attendants to get ready. It’s quiet, private, and has its own bathrooms and bar. With a working fireplace and an Italian fresco mural, it’s a lovely backdrop for any pre-wedding photos of the blushing bride and her ensemble, a first look reveal, or a touching mother-daughter moment. 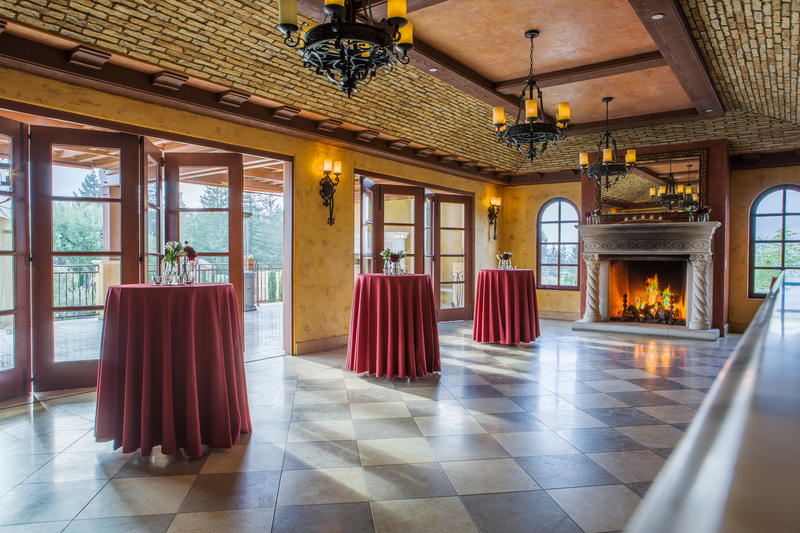 The Italians are known for their passion, and we’ve successfully captured that passion with our Tuscan-themed grounds. You’ll be swept away by our intimate garden vignettes, rich greenery and flowers, sparkling fountains, and open-air dining areas. These features are the perfect recipe for a romantic, memorable wedding that your guests will still be talking about years later. The weather in the Santa Cruz Mountains region is reliable and mild. Your guests will be able to sit outside and enjoy the fresh air and beautiful surroundings during your ceremony without the threat of a sudden downpour. We understand there’s a lot of pressure to get everything just right for your wedding day. That’s why we only work with premier local caterers and DJs. 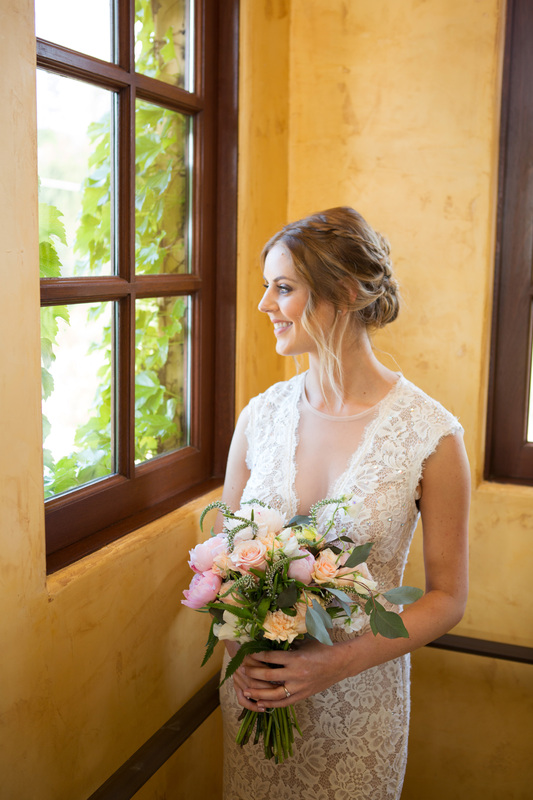 And for the brides who are feeling overwhelmed, we can provide you with a list of trusted, reliable photographers, florists, bakers, and other vendors. No matter who you choose to work with, you can rest assured your wedding will be in good hands. If you’re interested in celebrating your special day at Regale Winery and Vineyard, visit our wedding page and full out an inquiry form for more information. You can also see more pictures of Regale weddings on Pinterest and Instagram. Our expert vintners are dedicated to the fine art of making wine. But they wouldn’t be able to fully devote themselves to their craft if they didn’t have some behind-the-scenes help from two of our most important employees: Rosie and Sangiovese! Rosie and Sangiovese (who prefers the less formal Sangio) help keep things at Regale running smoothly. Their most important job is patrolling our vineyard and chasing away unwanted pests. Of course, vermin population control isn’t their only duty. Rosie and Sangio also have many important administration tasks, including napping on keyboards, napping in the middle of the office floor, napping on laps, and some occasional light filing. Rosie, the more outgoing of the pair, is a pretty little thing. Her white and grey coat is accented with soft, sunset-orange markings. She’s also quite the charmer. You can often find her meowing for pats and attention. In her spare time, Rosie loves “collecting” bugs and lizards (which she wants to share, much to our dismay). While Sangio is more shy and reserved, he’s still a very handsome boy with a coat of grey and tabby markings. He also has quite the appetite and can sometimes be coaxed over with the promise of food. On his braver days, Sangio will visit us in the office to make sure everyone is doing their work and staying on task. If you’re interested in meeting Rosie and Sangio (and maybe even tasting some of our delicious wine! ), visit our website tasting page for days, times and details. The Santa Cruz Mountains: An Ideal Location for Growing Grapes. 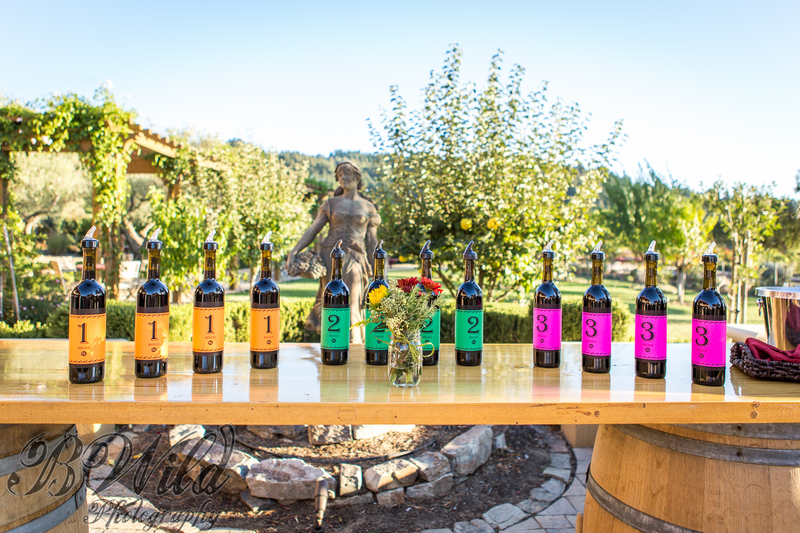 At Regale Winery and Vineyards, we’ve built our core winemaking values on honoring the traditions of those before us: To always question and innovate. We push ourselves to transcend the everyday and create wines that are extraordinary. When you visit our winery and take that first sip, you experience not only the fruits of the labor of our master winemakers, but also the labor and experience of our vintner forefathers, who first settled in the Santa Cruz Mountains in the late 1700s. It wasn’t until the 1850s that the Santa Cruz Mountains region revealed its true potential — some of the most influential pioneers in California’s winemaking history sought to seed the land with grapes of a much higher quality than their unrefined ancestors. Early vintners included John Burns, John and George Jarvis, Charles Lefranc, Paul Masson, and John Stewart, men who all made substantial, lasting contributions to the growth and success of the region’s commercial wine industry. But of all the places to build a winery, why would winemakers choose the Santa Cruz Mountains? Minimal rain, warm weather that encourages and accelerates ripening, and soil that is “fertile, alluvial and loamy in nature” are the key elements responsible for the success of the region’s wineries. The mountains are sliced in half by the San Andreas Fault. The North American Plate’s sandstone and Pacific Plate’s uplifted ocean floors are constantly grinding. The result? An utter jumble of shallow, rocky soils, not unlike portions of the Sonoma Coast. Two converging climates are also at work — cool moderating influences of the ocean to the west, and a similar, if warmer, influence from San Francisco Bay to the east. Slightly warmer sites can ripen a subtle style of Cabernet, while delicate Pinot Noir and Chardonnay thrive nearby. The verdant, yielding land of the region, combined with indulgent weather, allows us to handcraft batches of remarkable wines every year. The grapes from our estate-grown Pinot Noir vineyard and other exceptional local vineyards give birth to wines that stand apart from the rest with finesse, provocative personality, and balanced acidity. We produce some of the finest Californian wine available, yet many wine connoisseurs and experts feel Santa Cruz wineries are overlooked compared to Napa and Sonoma. This is the perfect opportunity for wine lovers to delight their palates with something new. Make the relaxing, scenic drive to Regale Winery and experience the charm of Old World wine country, tucked away in the mountains of Santa Cruz. If you’re ready to taste all that Regale Winery and Vineyards has to offer — including Pinot Noir, Cabernet, and our popular Chardonnay — visit our website tasting page for days, times and details. Stacey Vreeken, “Uncorked: Vines to wines — History of grape growing in Santa Cruz County,” Santa Cruz Sentinel, Aug. 27, 2012. Matthew Citriglia, “Bordeaux vs. California Cabernet — Why They Should Never Be Compared!” Winegeeks.com. Jon Bonné, “Santa Cruz Mountains wines reach a peak, quietly,” San Francisco Chronicle, Feb. 28, 2010. 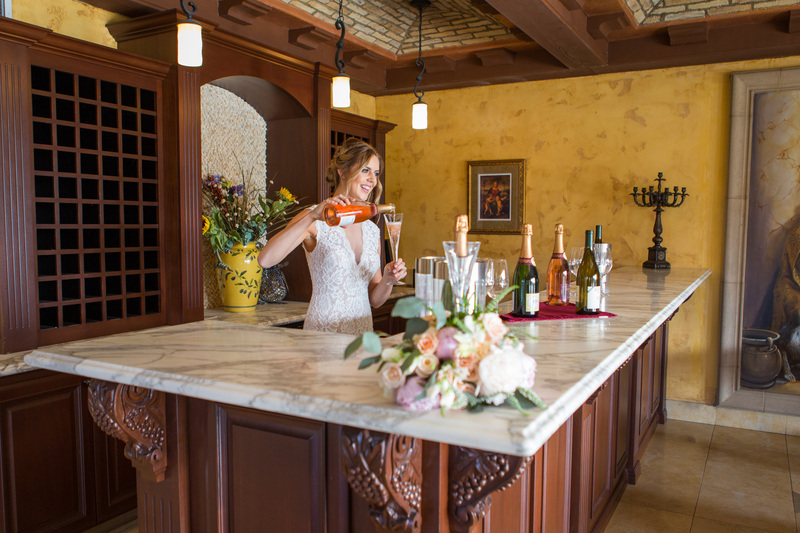 Inspired by Italian landscapes and Old-World villas, Regale Winery and Vineyards provides an opportunity to share the relaxed and sophisticated lifestyle that surrounds the production of wine in celebration of your wedding. 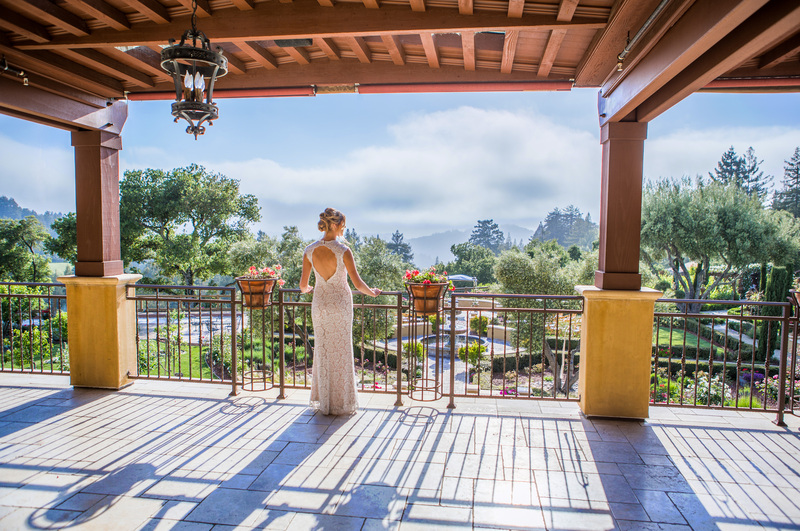 Imagine saying your “I Dos” in the formal gardens, surrounded by lush greenery with fountains, olive trees and a bocce ball court complete with a view of the mountains. 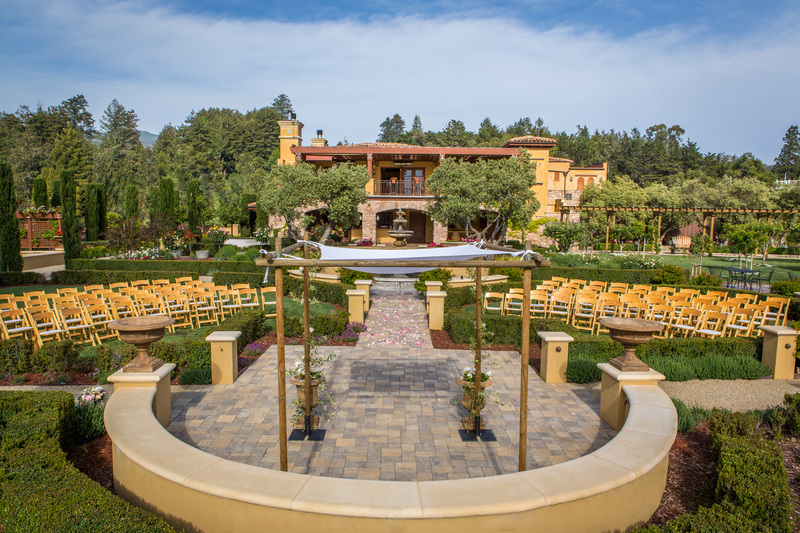 This space is perfect for an outdoor ceremony under the clear Californian sky. For your reception, you can utilize the gardens, in conjunction with the Outdoor Bar and Courtyard, which includes a covered portico with large granite tasting bar and a neighboring wood-fired pizza oven. The orchard patio offers another gorgeous outdoor space complete with market lights, trellised grape vines, and a luxurious reclaimed wood barn backdrop perfect for an outdoor reception. 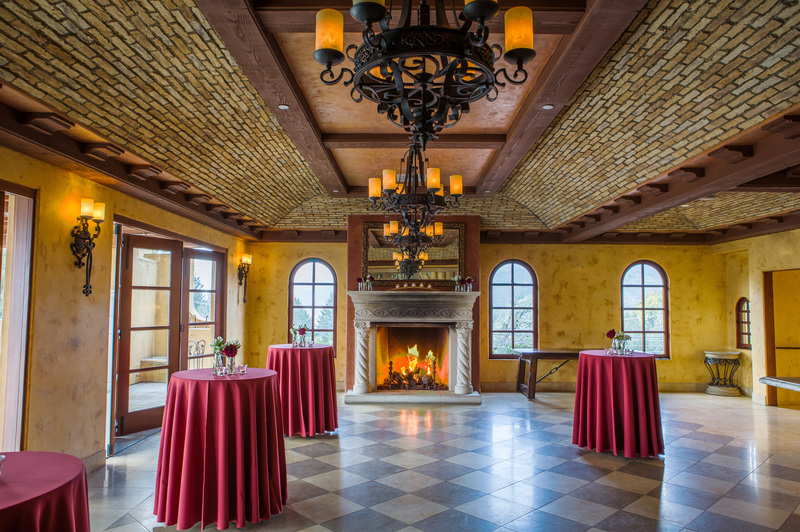 For a romantic and welcoming indoor affair, the second floor dining room features a vaulted travertine ceiling, Italian fresco paintings, Venetian plaster, and ornate fireplaces to create an old-world Tuscan atmosphere. 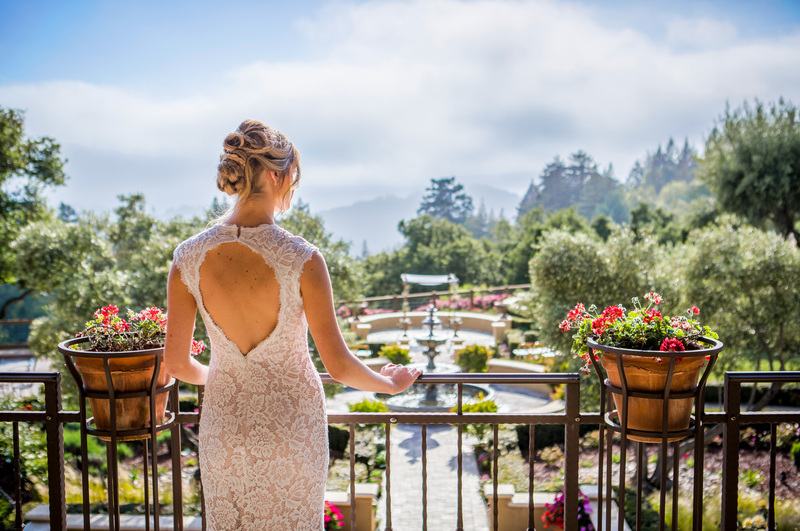 The room opens onto a heated, open-air terrace with breathtaking views of the coastal range and our formal gardens. 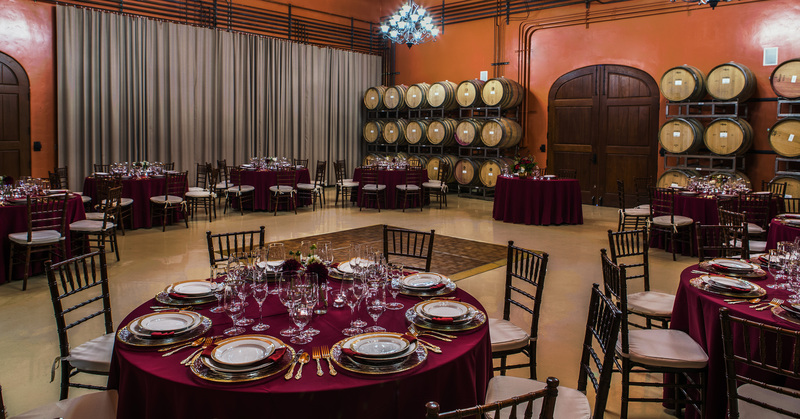 End the evening with dancing in our spacious barrel room against a backdrop of wine barrels. 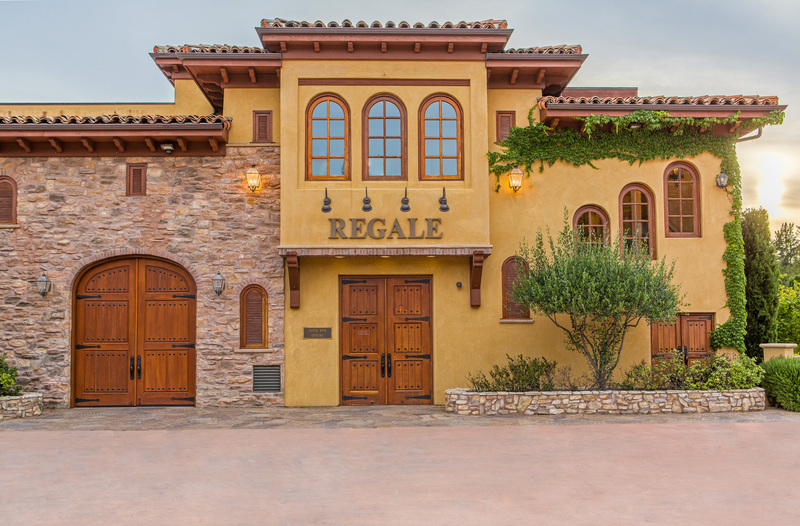 Regale is a truly unique, exclusive venue designed to reflect old world wineries in Italy & France. 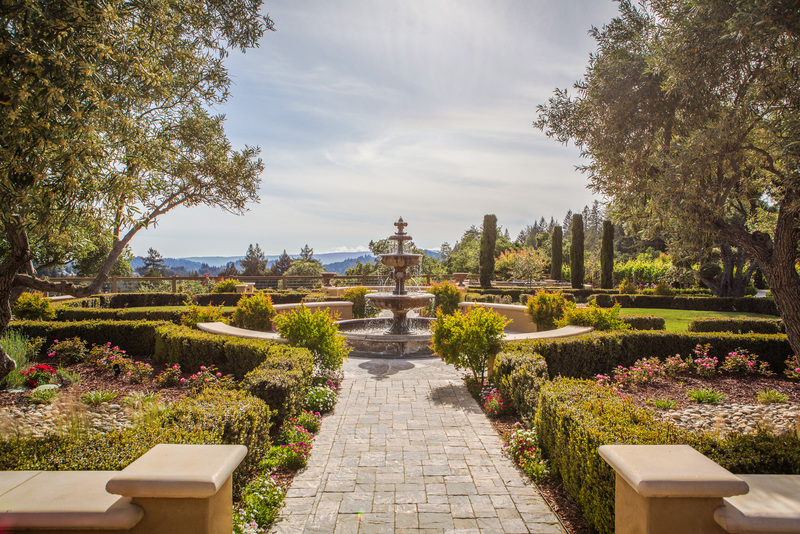 Our lovely Italian fountains, ornate gardens, olive orchard & vineyard offer an unforgettable setting for your event. Lush gardens with fountains, an olive orchard, open lawn space and a bocce ball court complete with a view of the mountains is a beautiful outdoor ceremony location. 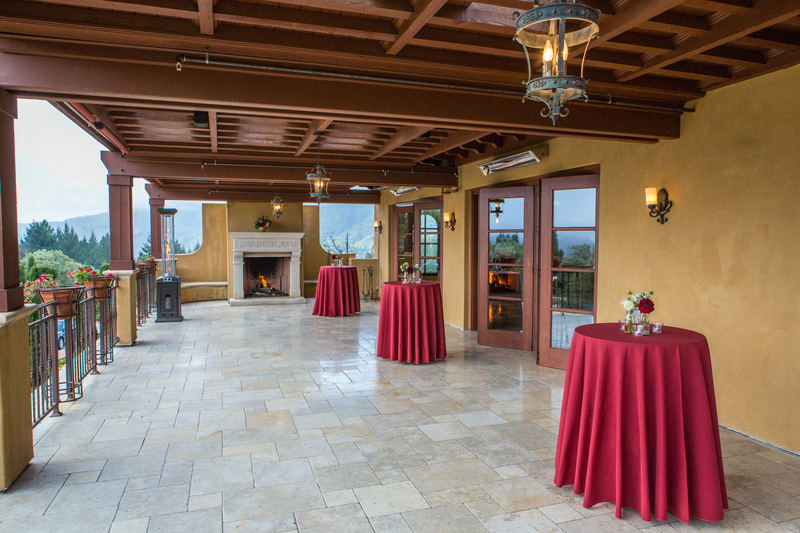 For your reception following the ceremony, utilize the gardens in conjunction with our outdoor bar and courtyard which includes a covered portico with large granite tasting bar and a neighboring wood-fire pizza oven. This second-story room in the villa has a working fireplace and an Italian fresco mural as well as its own private bathrooms and bar. A beautiful space for a pre-dinner reception or a palatial bride’s room. This second-story enclosed veranda overlooks our formal gardens and is accessible via an exterior staircase and elevator or through the executive dining room. This beautiful space, protected from the elements, is perfect for a reception, small seated dinner, or covered ceremony. 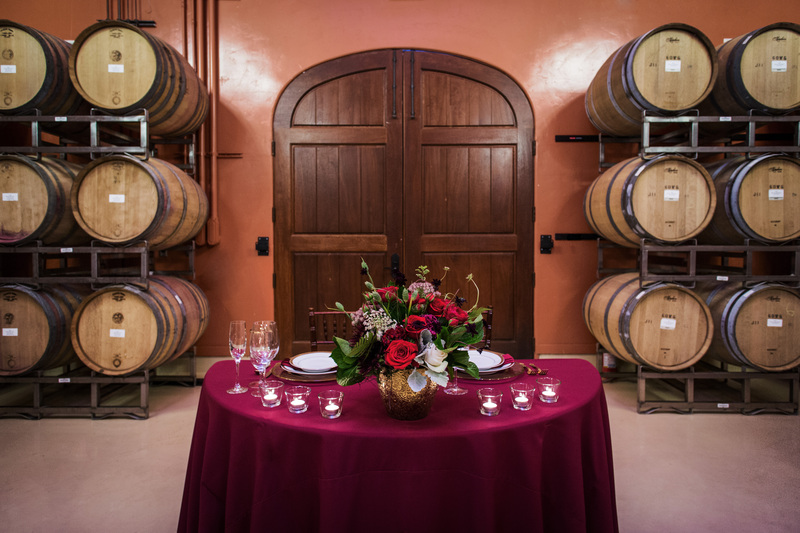 Our barrel room is complete with cocktail seating and opens into the adjoining tasting room creating the perfect space for dancing after dinner, or can be utilized as a cozy interior space for meetings or dining in case of inclement weather. Our orchard patio is highlighted with trellised grape vines and fruit trees, a romantic setting for outdoor dining. The space is complete with market lights, built-in sound systerm for music or microphones, and a granite bar in a rustic barn accented with reclaimed wood. Gather around our table as we throw a traditional New England Lobster Boil complete with lobster bibs & crackers in honor of Father’s Day. This fun event will be held in our new orchard patio with the beautiful backdrop of the Santa Cruz Mountains at sunset. Ticket includes one lobster per person, and the traditional “seasoned boil” preparation of prawns, Louisiana hot links, corn, artichokes, onions and potatoes for the feast. Be prepared to dig in and get messy! Wine will be sold by the glass and bottle – no offsite wine/alcohol permitted. In the art of entertaining, little can rival the aromatic, colorful presentation of Paëlla. Native to Spain, where affection is exchanged as much in spoonfuls as it is in kind words, this dish is a feast. Watch a team from Hola Paella cook their paella in front of you with only the freshest ingredients and invite you to watch every step of the process around the giant paella pan. Purchase your tickets today; this will be a sold out event! Are you a fan of our guitarist, Hood Chatham? Great news! He will grace us with his talents on select weekends this summer. You asked and we listened! We’ll have our wood fired pizza oven blazing on Sundays. Houndstooth Pizza will be vending hot pizzas in addition to assorted small plates for our guests. Stop by on Sunday afternoons for lunch at Regale Winery! Here at Regale, we love parties – especially one with a good icebreaker, and, even better, something involving wine! Might we suggest incorporating a little blind wine tasting to your family gathering, game night, company team building, or throwing a whole party aimed at getting your guests interacting with a fun blind tasting. It will get people thinking, comparing notes, and most importantly… talking! If you are looking for a gorgeous locale as a bonus, come visit us for a private event at Regale and have a blind tasting hosted by one of our wine specialists. It make your party an event to remember and is great to add to an offsite as a team building activity! Gather three-five bottles of wine (definitely throw a Regale bottling in there!) – ideally single varietal bottles from different regions and vintages. Alternatively guests can each bring a favorite mystery bottle to share. 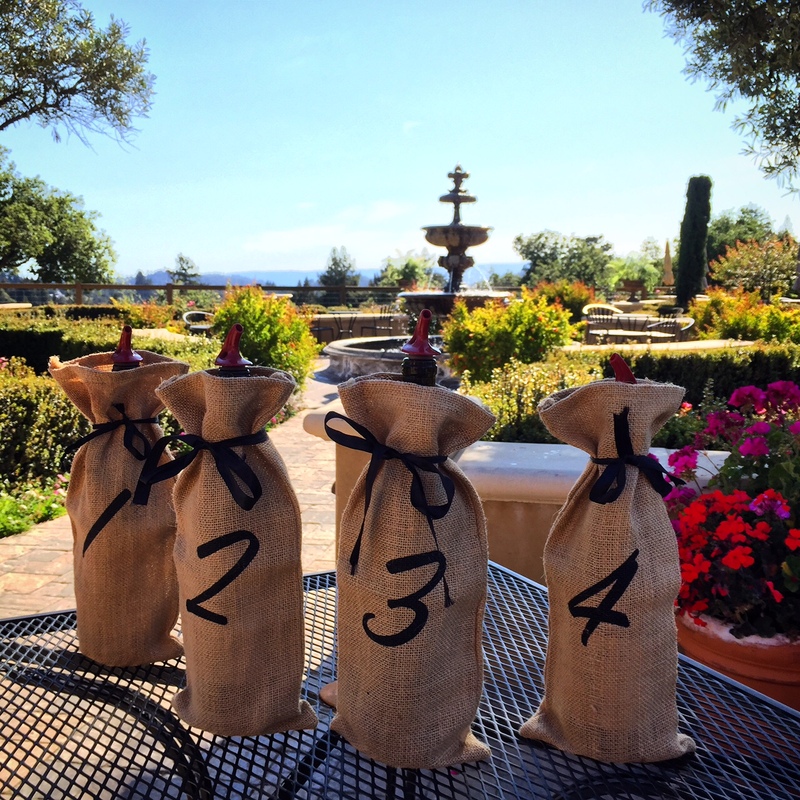 Cover and number your bottles – for our team building events at Regale we have snazzy burlap blind tasting bags printed with numbers, but you can use brown paper bags, decanters, or even wrap your bottles in aluminum foil! Remember- a bottle’s shape can be a cue towards the varietal, so keep this in mind when selecting how to disguise the bottle if your guests are wine savvy. 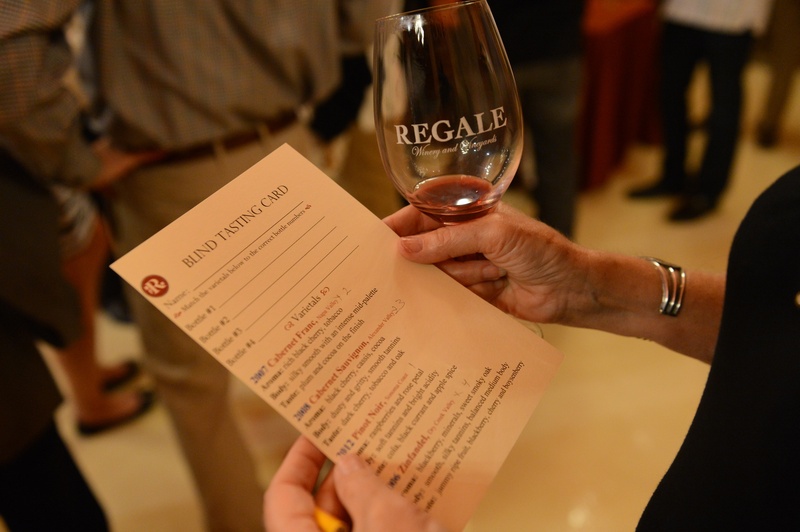 Provide tasting cards so your guests can take notes and eventually submit their guesses. Decide if you want to provide a key of the different offerings or leave them completely in the dark. What color is the wine? Whites gain color as they age, reds are most vibrant when young and fade or take on a more brick color with an orange or brown hue. How opaque is the wine? Can you read text through the wine or is it so opaque that light barely comes through it? 1st Sniff – Does it remind you of varietals you have tasted in the past? Tannins, if any- how heavy? What varietal could it be? Use your past tasting experiences and memory. Are there any varietals you can rule out? The important part is the journey to reach a conclusion – don’t worry too much about the final guess! The more you practice, the better you get – so cheers to that!